Browse. Discover. Listen. Share. It’s the cycle of music discovery for many avid music lovers. And if you’re one of many people who love sharing that discovery on social media, then you should definitely read this article. These apps let you share discoveries to both Instagram and other apps. Discussing music on Instagram is so much more than just following the #Music hashtag. There are hundreds of music-related hashtags, the official @Music account, lots of band accounts, and lots of apps to play with too. 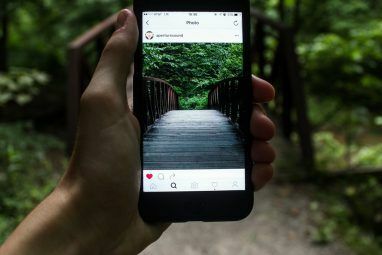 The InstaPlayer iOS-only app is primarily a way to “play” Instagram pictures from your friends and from your own account with some tunes playing at the same time. You can use it to create a slideshow that can be pushed to your Apple TV Apple TV vs. Chromecast: Which Streaming Solution Is Right For You? Apple TV vs. Chromecast: Which Streaming Solution Is Right For You? You know you want either an Apple TV or a Chromecast. The problem is, you're not sure which… Read More for the ultimate party tool. The app is really vintage themed, so it also lets you play with neat vintage tools like making instant Polaroid pictures. Quirky and adorable. It’s really easy to use IFTTT to mash your Instagram activity to your music apps. Sadly, you can’t do things the other way around — although it would be awesome to have a recipe that sent cover art from a Spotify starred track to Instagram, or art from a track you just uploaded on SoundCloud to Instagram. One day, maybe. In the meantime, you can do some interesting things, nonetheless. IFTTT actually connects to anything IFTTT Now Connects to Anything: Introducing the Maker Channel IFTTT Now Connects to Anything: Introducing the Maker Channel The potential uses for IFTTT are endless. But until now, it's been difficult to interface it with your own hardware projects. Today, that's all changed. Read More these days, so your options are limitless. Maybe with a bit of work you could hack it to post to Hootsuite or LaterGram via the web so it can remind you to post to Instagram later. 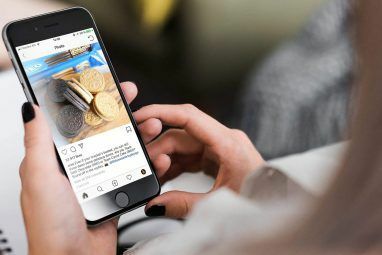 So, try making a recipe to send anything you post to Instagram with the #Music tag attempt to add a track to a Spotify playlist using your gram description. Or maybe get the same trigger to favorite a track in Last.fm. I’m sure you’ll think of some way to wrangle it. SoundShare is a music discovery app How To Find New Music You Love Using Android How To Find New Music You Love Using Android You can make use of these Android apps to explore more artists that you may not know about yet. Read More that is currently iOS-only, but Android users can always hope for the future. It’s a great way to browse songs on the Hottest 100 billboard, then preview, purchase or watch the film clips. When you favorite a track, you can instantly share it on to Facebook, Twitter, Instagram and WhatsApp. So, basically it’s a quick way to show off your awesome taste in music. Fun stuff. The Sounds App is for both Android and iOS, and lets you discover music from iTunes, Spotify and SoundCloud. You find these amazing new tunes by listening to curated playlists Get A Handpicked Playlist Of The Week's Best Music With Noon Pacific Get A Handpicked Playlist Of The Week's Best Music With Noon Pacific Noon Pacific takes the best part of radio and isolates it into a brilliant web app. Clark Dinnison handpicks 10 new songs based on recommendations by 25 top blogs and shares them with you. Read More that have been made by trending artists and labels. Also, you’re given a daily sound to check out, just to keep you discovering new songs with the app. Once you’ve found that gem of a song for the day, you can share it to Instagram, Messenger or Snapchat using Sounds. You’re also building a Sounds profile of the songs you’ve shared. So, it’s the ultimate hipster music discovery Enjoy Curated Music Mixes And Discover Great Artists On 8tracks Enjoy Curated Music Mixes And Discover Great Artists On 8tracks Unlimited streaming music, for free, legally available all over the world, and with no audio ads. Have I got your attention yet? Dive into one of the best music websites in existence. Read More app. 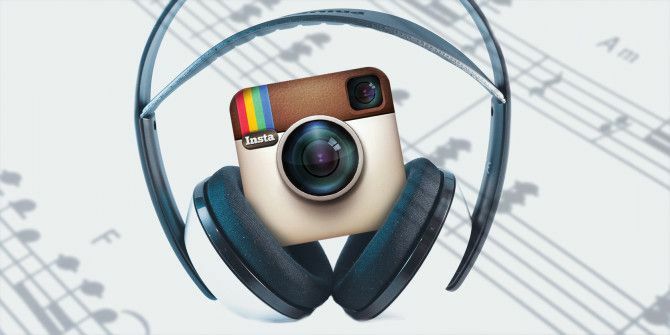 Pic Music is really what most people have always wanted in a music-Instagram integration. Use the iOS app to create a slideshow of photos from your phone with your favorite tunes in the background. It’s really straight-forward and intuitive to use. Once your masterpiece is complete, you can share your videos to Instagram, Vine, Viddy, Tumblr, and Snapchat. Android users can actually make slideshows and short videos using Photos, but if that’s not right for you there are plenty of other ways to create slideshows with music How to Create Movie and Photo Slideshows With Music How to Create Movie and Photo Slideshows With Music Get creative. You spend all that time taking little videos and photos of everything you do, just to leave them electronically rotting on your hard drive. What a waste! Read More in Android. You love music, obviously. Do you love singing? Of course you do. How about making silly videos of yourself singing famous pop songs? Yes, yes, yes? Cool, you’ll love DubSmash Crazy and Creative New Apps That Change Messaging for the Better Crazy and Creative New Apps That Change Messaging for the Better It's easy for social media conversations to fall into a rut. Thankfully, there are popular new apps being widely adopted that guarantee sending and receiving messages will be anything but dull. Read More . Sing along to songs, then upload the video of your amazing performance to Instagram or whatever other social network you prefer. Hey, celebrities are doing it, why not you? How Do You Blend Instagram and Music? 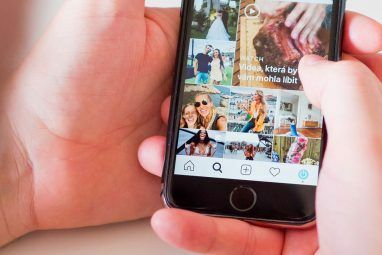 No doubt you’ve been meshing music and Instagram in your own way until now, and will continue to do so even if you’re now considering trying some of these apps. Tell us about your unique way of being musical on Instagram. Oh and don’t forget to follow @Music! Explore more about: Indie Music, Instagram.